When it comes to digital advertising, Quora might not be the first advertising platform you think of. In fact, you might not even have been aware that you can run ads on Quora (or even heard of the site). Basically, Quora is the grown-up, serious version of Yahoo Answers. Questions on Quora are more interesting than “I locked myself out of my account, help!” and the answers are more in-depth, thoughtful, and reliable. 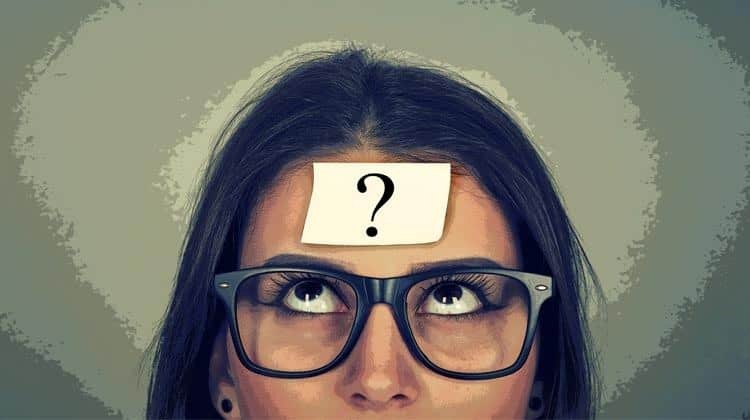 Quora is an excellent source of information, with plenty of experts across a million and one diverse industries chiming in to share their experiences and knowledge. Previously, Quora could only be used for thought leadership by responding to questions and hoping it was enough to build a strong reputation. As of June this year, however, businesses can now run Quora Ads. Even using Quora organically is a great way to increase your visibility thanks to its incredible reach. Quora questions and answers fare well in search engines, especially since more and more users are typing out full questions like “which exercise plan should I use if I want to gain muscle and lose fat” into Google itself. Plenty of Quora questions and answers can rank on the first page of searches as a result. Because of this, many users are exposed to the site and its content even if they don’t actually use Quora. 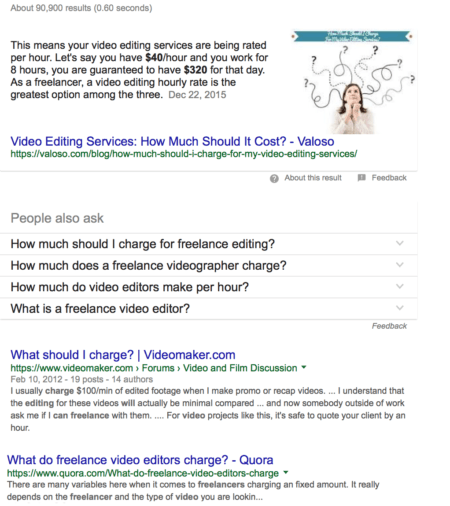 The third result on this search for video editor costs was an answer from Quora. Quora also has a large and very diverse audience, even amongst active on-site users. According to an answer from the Founder & CEO of Quora, the site currently has over 200 million monthly unique visitors. While this doesn’t come close to Facebook’s 2 billion, it’s still a significant audience. As an added bonus, anyone who has run Facebook Ads or Google AdWords will be able to get the hang of Quora Ads quickly. It works on a bidding system, and has a similar ad creation process. You can run both text ads and mobile app download ads on Quora. These ads are text only, and they fit seamlessly into the platform. They’ll appear either above or in between the answers on a page. When you’re ready to run Quora ads, click here to get started (you’ll need to setup a business account for Quora). 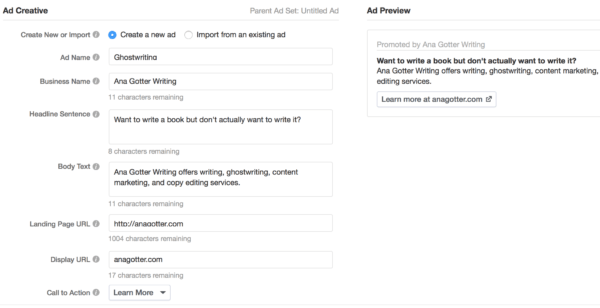 The ads manager will look similar to other PPC ad platforms you may have used, including LinkedIn Ads or Facebook Ads. To get started, click “create campaign” in the top right corner. First, you’ll name your campaign and choose whether you want your objective to be conversions or mobile app installs. Immediately below this, Quora will encourage you to set up their tracking pixel. We’ll show you how to do this in the next section. Underneath this, you’ll set a maximum daily budget. You can add a lifetime budget if you’d like. While you can run your campaigns indefinitely (or until the lifetime budget runs out), I always recommend setting start and end dates. Quora Ads, like Facebook, uses ad sets. When creating ads, you can use ad sets you’ve already created, or create new ones. When targeting, you’ll choose primary and secondary methods of targeting. The primary method will either be a custom audience list or topic targeting that works like Facebook’s interest targeting. 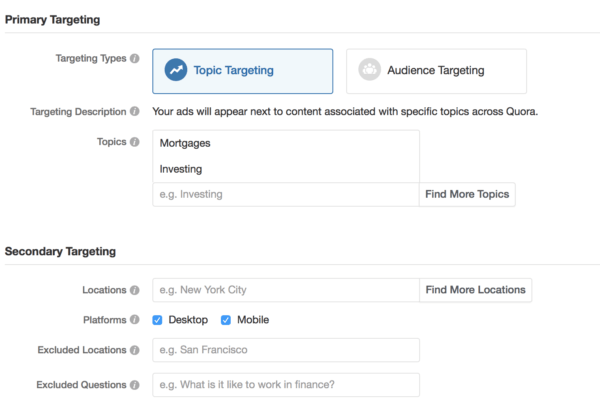 Your secondary targeting will focus on locations and device targeting. In this section, can choose to enable desktop placements, mobile placements, or both. You can also exclude locations or exclude question types. At the bottom of this page, you’ll set your bid. This will be the cost per conversion or cost per mobile app install. Quora suggests a bid for you. My suggested bid was $0.86. In the last section, you’ll create your ad’s copy. You’ll enter a headline, a description, your destination URL, and the CTA of your choice before being asked to review your campaign and submit it for approval. 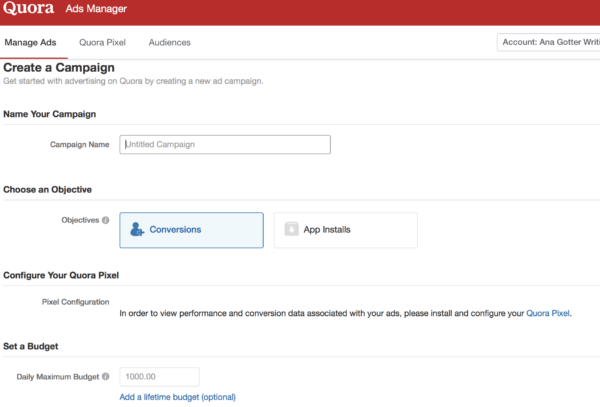 Quora’s tracking pixel works just like Facebook’s tracking pixel: it both allows you to track conversions and create audiences based on website activity, making it an essential part of Quora Ads. Setting up your pixel, fortunately, is just as easy as setting up Facebook’s. Navigate to the ads manager, and click on the “Quora Pixel” tab. You’ll see a “Setup Pixel” button. 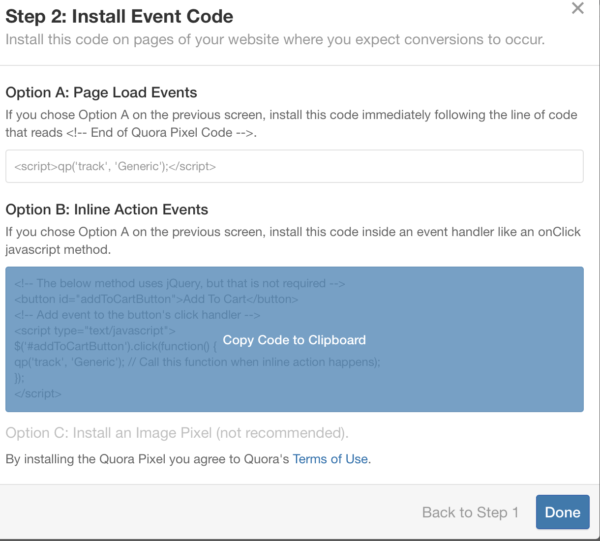 From there, Quora gives you two options for pixel installation. 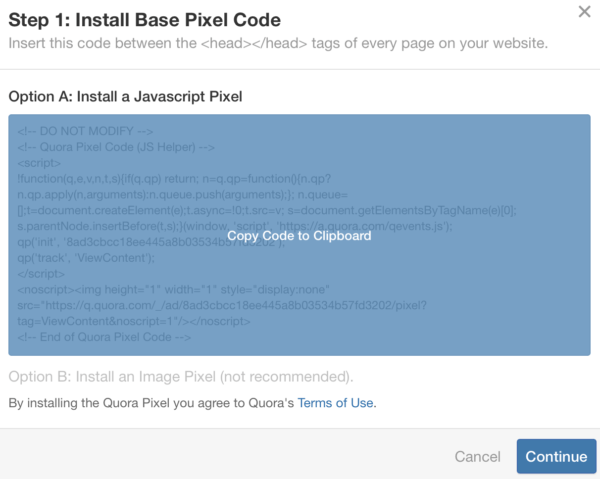 You can install code onto your site, or install an image pixel. I highly recommend the first, as it will load faster and is much less likely to be blocked by extensions on users computers. Copy the code and place it on your site’s pages. To do this, I like to use the WordPress plugin Insert Headers and Footers. Once you install the base code, you’ll want to add different one of two “event” codes on each page you placed the pixel. This helps Quora register what types of conversions happened on each page. After you do this, verify a page on your site where the pixel is installed. It should register right away. 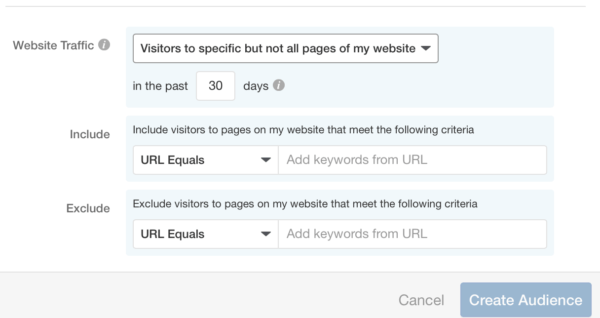 You can create targetable audiences on Quora that help you to retarget to users who have recently visited your site. 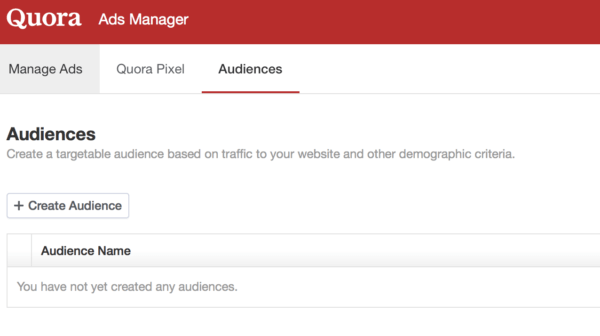 Under the Ads Manager, navigate to the “Audiences” section and click “Create Audience.” Your pixel will need to be set up in order to create these audiences. Quora lets you both name and describe your audiences. This is really helpful, because it allows businesses to keep track of multiple similar audiences. 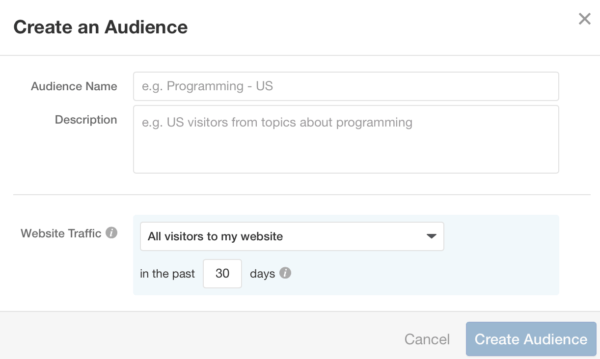 You can adjust the time frame used to create the saved audience, choosing anywhere from a 1 day range to 180 days. What Types of Ads Should I Run on Quora? People come to Quora looking for reliable information, so showcasing your professional expertise through a text ad can help drive conversions for your business. In some cases, this could even help put you in front of users during the consideration stage. 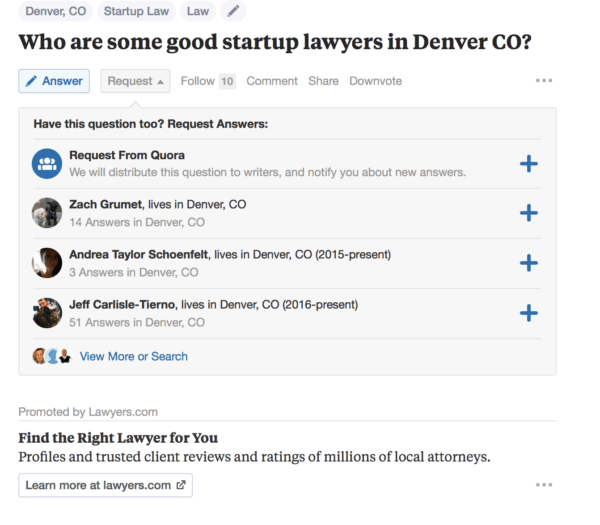 The screenshot above is a great example, with users being shown an ad for local lawyers when they search for—you guessed it—local lawyers. Both B2C and B2B businesses should consider testing Quora ads. Their self-serve ads manager, bidding system, and targeting are all things that businesses familiar with PPC have seen before, making it easy to dive right into the platform. The relatively low competition from other advertisers could mean lower CPCs and more attention from users. The two could be a winning combination. What do you think? Have you used Quora ads? Which would you rather use, the text ads or the mobile app installs? Leave us a comment and let us know what you think! If I don’t want to install Tracking Pixel first, the ad also can run, right? Hi Ana I’m very much interested about qoura ads I really want to try something outside Facebook and others. And nice work Cheers. Hello Ana Gotter. Hope everything is good. I want to clarify some things. First of all my web site is https://arizonatoys.in/. I want to run my quora ad. Just tell me what type of ad should be more effective for my site. I want sales from this site. The second thing is what should my budget. The third one is where I check my ad running status. Please help me by describing these points briefly.